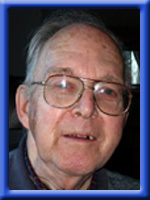 THOMPSON – William Lloyd, 84, of Port Mouton, Queens County, passed away peacefully at Queens General Hospital, Liverpool on Thursday, August 26th, 2010. Born in Montreal, Quebec, he was the son of the late William and Phyllis (Wood) Thompson and loving husband of the late Maryellen (Kinsella) Thompson. Survived by four sons: Timothy (Denise Lauzon) of Vaudreuil, PQ; Alexander (Vicky Metcalfe) of Kirkland Lake, ON; Matthew (Renee Lavigne) of Choisy Rigaud, PQ; Phillip (Carolle Bonnar) of Grenville, PQ. Three daughters: Judith (Roger) Menard of Chester Grant; Mary Esther of St. Lazare, PQ; Catherine of Pierrefonds, PQ. 12 grandchildren and 9 great grandchildren. William “Bill” enjoyed gardening, stamp collecting, coin collecting and the great outdoors. Cremation has taken place under the direction of Chandlers’ Funeral Home, Liverpool. A memorial service will be held Thursday, September 2nd, 2010 at 11:00 a.m. in Port Mouton United Church. Reverend Bethe Benjamin-Cameron officiating. Burial will be in Seaside Cemetery, Brooklyn. No flowers by request. Donations may be made to the Cancer Society or the Queens County Branch of the S.P.C.A. Online condolences may be made to www.chandlersfuneral.com. Ted said this morning “Bill was a good man”. He proved it in his lifetime and we will miss hearing his voice. He is back with his loving Maryellen now and at total peace. “Life’s one absolute is that we will leave it.” See you again, Bill, in a much more beautiful place than this world can ever be. Deep sympathy goes to his children and all the family. My condolences on the passing of your father. I will always remember the great smile that he had. Sorry to hear of Bill’s passing. Hope you find comfort in each other and hold onto your memories. I am so sorry phil for your dad and I love grand-pa I have so much fun with him and I will miss you grand-pa you are in my heart (L)love you gran-pa love your granddaughter sophie you will be fine where are you now you will be relaxing and be peacefull he will think about you. Nancy and I were sorry to learn of your father’s passing. We enjoyed chatting with him from time to time. He was one very interesting person in a very interesting family and he will be well remembered by all who knew him. To all those Papa leaves behind: our hearts are heavy with greif and a sence of loss for you. Papa has always held a special place in our hearts and minds. It’s pleasing to hear he was surrounded by people who loved and cherished him.